The Owls extended their winning streak to seven games. After a slow start in the first half, the Owls opened the second half with a 17-4 run, dominating to their 69-51 win against the Fordham Rams Saturday afternoon. Senior guard Shey Peddy led the Owls to their seventh straight win with a game-high of 21 points, four steals and a career-high of 11 assists. It was another impressive performance from junior center Victoria Macaulay who scored 18 points and had a game-high seven rebounds. Alongside Macaulay and Peddy, senior guard Kristen McCarthy managed to score eight points and dished out three assists. “But I thought we definitely did a better job in the second half of getting into the passing lane and taking things away and making it a little bit more difficult for them,” Cardoza added. The Owls managed to get into a rhythm that left the Rams fighting to keep possession of the ball and make solid shots. This rhythm was greatly influenced by freshmen guards Rateska Brown and Tyonna Williams along with junior forward Brittany Lewis who helped the upperclassmen both on offense and defense. Brown was able to knock down a three pointer – scoring a career-high of seven points and shooting three-of-four from the floor. Initially starting senior center Joelle Connelly in the first half, Cardoza opted to play the game with four guards to handle the speed and shooting attempts of the Rams. Williams and Brown worked off the bench to provide the extra guard play on the court. Williams was able to capture three steals, one less than Peddy. While Lewis and Macaulay both landed a blocked shot each, as they kept some size on the court for the Owls. HUA ZONG TTN Senior guard Kristen McCarthy scored eight points for the Owls in their win against Fordham on Saturday. Peddy is currently ranked second in the Atlantic Ten Conference at 17 points per game and manages the weight of being a leader for her team on and off the court. Macaulay has become the team’s asset in the paint. 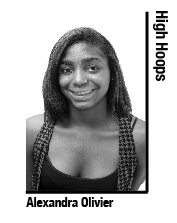 Her ability to not only defend, but shoot the ball effectively makes her a key competitor in the Owls’ lineup. “[Macaulay] has been doing a really good job mixing it up scoring inside and knocking down a 15-foot jump shot, but whenever we can put the ball on the floor and get to the basket that’s always a higher percentage shot,” Cardoza said. The combination of Peddy’s experience, Macaulay’s athleticism and confidence of Williams and Brown provides the Owls with a well-rounded team ready to compete in the remaining A-10 match ups. The Owls head to Saint Louis for their next match up on Wednesday, Feb. 8. Erica Covile has emerged as a force on the offensive end. 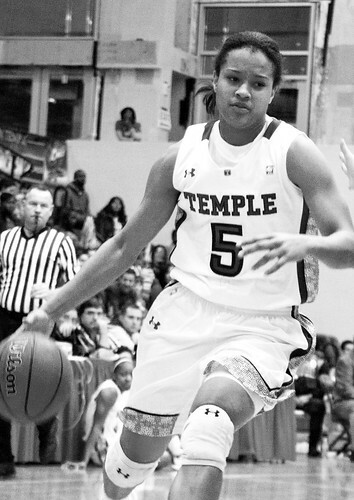 The Owls beat Delaware State University 75-61 Tuesday at McGonigle Hall.